Few things are as impressive on a prototype railroad as unit trains. They consist of dozens of cars of the same type, all going from one point of origin to one destination — with no intermediate switching. This is what railroads do really well — move really large quantities of heavy materials. The unit train (Ganzzug in German, with ganz meaning complete) has been around since era 2, and is a staple of railroads all over the world. In the U.S., unit trains can run up to 120 cars or even more. In Europe, they seldom exceed the 40 cars typical of a long-distance freight train. But, even 40 cars can be impressive. And 40-car European coal trains may rate as much horsepower as a 120 car American coal train — in part because they are expected to keep up the the flow of traffic, including on steep grades in mountain terrain. Okay, we’ve already stipulated that unit trains consist of cars of the same type that stay together for the entire movement between end points. Unit trains seldom have backhaul, meaning that they return to their point of origin empty. What kinds of goods move in unit trains? And these are only some of the major categories. While most intermodal trains running between major terminals fit some of the criteria of unit trains, they are typically not considered unit trains. However, intermodal trains consisting entirely of trailers or swap bodies of a single freight logistics company (Spedition in German), operating between terminals of that company, are considered unit trains.because in that case, the Spedition is simply chartering a train to move its equipment. While you may find unit trains impressive, you may also think that they can only be run on large club layouts, and that, if you are a stickler about car numbers, you will not find enough cars with different numbers. Well, neither is really true. In fact, unless you are modeling only a very low traffic branch line, you probably should have at least one unit train on your layout, as they are part of the everyday picture of prototype railroads. Even branch lines can see unit trains, if, for instance, there is a coal fired power plant located on that branch line. Okay, focusing on just European trains, lets do the numbers: On model railroads, everything is necessarily condensed. Prototype main line passenger trains may run up to 18 cars, but we’re not going to model these, because, among other things, the passenger platforms would take up an enamors part of the layout. The same goes for freight trains. Even clubs are unlikely to run freight trains of more than 20 cars, as these also require substantial yard and passing tracks. For a personal layout, though, 15-car freights (with shorter freight cars) look quite plausible; with some of the longer modern freight cars, a 12-car freight would be about the same length. Unit trains do not always have to be the maximum length (or total tonnage) allowed on a particular line. This factory-weathered HO GATX tank car is part of the six-car Roco 75972 set offered in 2017. The six cars alone give you a train length of over a meter — and provide a good start for a unit train. Not indicated in the catalog — and only visible when viewing the image at the highest resolution on the Roco factory Web site — is the content that these cars are labeled for: UN hazardous material code 1268 (petroleum distillate products NOS [not otherwise specified]). So to add to such a unit train, you would want other cars labeled for this same product category — whether weathered or not. Finding 12-15 model cars with different operating numbers is really not that difficult. Model manufacturers often offer sets of three — and sometimes even four or more — cars of the same type with different numbers, as well as individual cars of the same type, with even more different numbers. So, if you are satisfied with just not having adjacent cars with the same number, you can fill out such a train with three or four copies of the same set. However, if you do want every car to have a different number, that’s still quite possible, as long as you are willing to do some research and to have some patience. The patience is needed because manufacturers will ultimately produce many copies of the same type of car (with different numbers) over a period of time. Research may be involved because you may want to see which of these cars the manufacturer has produced in the past — and to keep an eye out for them on the used market. Another factor that helps is that all of the cars in a unit train do not have to have the same ownership reporting marks. The most likely scenario would be to have some of the cars in the train owned by the country’s major railroad and some owned by a freight car leasing company such as KVG or GATX. However, it would be unusual to have more than two ownership reporting marks. All of the cars would still be carrying the same commodity. This is important for freight cars, which carry a UN hazardous materials code, such as 1202 for diesel fuel. The terminals at which unit trains are loaded are usually very large facilities, such as refineries, large mines, or similar facilities. The same is true for the destination terminals, such as large petroleum distribution centers, large power plants, etc. All of these are difficult to model on all but the largest layouts,. Even there, it’s best to locate these terminals at the edge of a layout, so that part of the terminal is visible — and the rest is assumed to be beyond the edge of the layout. Still, you would have to have some very long loading and unloading tracks, as the prototype facilities are usually capable of loading or unloading several trains at a time. So, for your model layout, any unit trains are best left as through trains, that appear on the visible part of the layout and then disappear again. 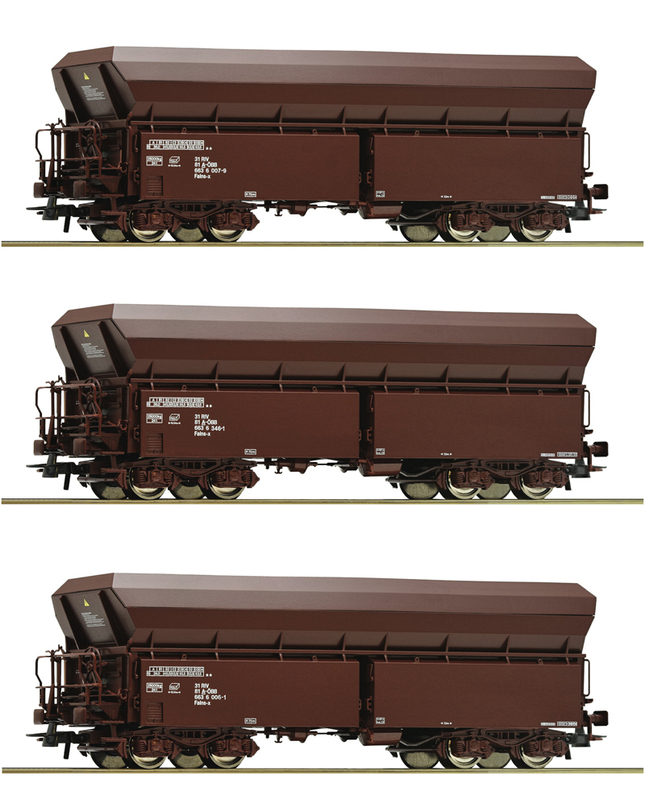 One benefit of enclosed freight cars — tank cars, covered hoppers, covered coil cars, etc. — is that the trains look the same whether loaded or unloaded. So, you could have turning loops at either end and run the same train in both directions. Or, you could run your engine around the train in a hidden storage yard — or even put a different engine on the other end of the train for its return trip. With open cars, such as coal or gravel hoppers or gondolas, the train will either have loads on their way to their destination or be returning empty to their point of origin. While it is possible to model loads in one direction and empties in another, this can get very complicated. So, you can always run only loads in one direction — with the backstory being that the empties are returning via a different route. I knew that Roco had produced sets of these cars in the past. In fact, when I began looking at the availability of these cars, I found out that not only had Roco produced at least three sets of three cars, all with different numbers, but at that time (in 2015) had a starter set with a 2048 Austrian diesel and three of these cars — which I ended up purchasing. And, that was in addition to many individual cars sold over the years. But, the more research I did, the more of these cars I found. So, I began compiling a table with data on all these cars. So far, I have found that Roco has produced Falns-x cars with more than 20 different numbers. I also discovered that in some cases, Roco produced cars with the same catalog number, but with different operating numbers during different production runs. 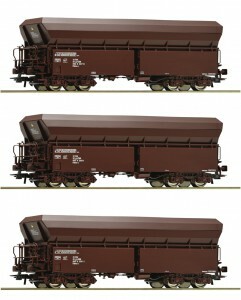 Currently (late 2017) Roco is offering yet another three car set of these hoppers, this time with era 6 style lettering. The major difference is that for era 6 cars, there is a different style of ownership code. And, the era 6 cars no longer use the “Pflatsch” logo. But, otherwise, these cars are identical to those of previous production runs — because the prototypes are simply re-lettered era 5 cars..
As I am focusing on the time around the era 5-6 transition, it would be entirely appropriate to have cars with era 5 and era 6 style lettering in the same train. I do not have any doubt that I will ultimately be able to acquire somewhere between 12 and 15 of these cars, all with different operating numbers. The above illustration shows a car from a weathered set of tank cars. (Roco appears to leaning toward gradually producing more and more factory-weathered rolling stock.) But, if you want to add other cars to form a longer unit train, you may only find non-weathered cars. Is this a problem? No. First, you can weather the “clean” cars yourself. But, second, it would be perfectly normal to find both clean and dirty cars in the same train. The clean cars could be newly acquired, or they could be recently serviced cars. As cars go into shops for repairs or standard maintenance, they are usually steam cleaned, giving them a near-new appearance. When a catalog number is re-used for variants of a model, these models are usually designated with a decimal point, such as xxxxx 1, xxxxx 2, xxxxx 3, etc. Models within a set that is sold under a single catalog number are usually designated as xxxxx A, xxxxx B, xxxxx C, etc. However, there are problems with each of these. Using a decimal point for variants of a single catalog number is a fairly recent development, and the catalog numbers with the decimal points were often not printed on the boxes that these models were sold in. In some situations, this may still be the case. For sets, manufacturers often do not designate which of the cars in a set is the A, B, or C car. Cars from these sets are, however, sometimes sold individually on the used market. So, if you see a listing for an xxxxx. B car, the only way to really tell which car this is is to look at the operating number. If the operating number is not clear from the photo provided by the seller, ask the seller. Most important, when similar used cars are sold, they sometimes end up in the wrong boxes. Either the seller does not know any better or he may not have reference material available to show which cars belong in which box — if the operating number is not listed on the box..
To Roco’s credit, that company now prints not just the catalog number but also the operating number on the boxes of most of its products. I assume that other manufacturers are now doing the same or will come around to that practice. Manufacturers, such as Roco, sometimes produce sets (of both freight and passenger cars) where there is one catalog number for the entire set, but each car also has its own catalog number. This provides a convenience for both the manufacturer and retailer. The retailer can place an order for the entire set, rather than having to order each car individually. The manufacturer then simply ships the entire pre-packaged set. Sell the set as a set, usually at a discount from the price that would have applied to the total of all cars sold individually. .So, in this case, if you already have the set, you do not want to order these particular individual items, as they would duplicate cars from the set. Compile a list of the operating numbers, so that you do not unintentionally buy duplicates. Manufacturers often do production runs of particular models that are never listed in their general catalogs. Sometimes these limited runs are intended only for distribution in a particular country or they are intended for a particular large retailer of chain of retailers. These models will still show up on the used market, however. Again, my recommendation is that if you want to build one or more unit trains, all with unique numbers, you compile your own list that includes both catalog numbers and operating numbers. And, when manufacturers announce new runs of an existing model with new operating numbers, they frequently use an old photograph and simply blur out the operating number — without showing what the new model’s (and/or in some cases the UN hazardous material code) actual number will be. Popular car types, such as open hoppers, tank cars, etc., of the same era and type and lettered for the same owner are often available from multiple model manufactures. With the current inter-operability of equipment from multiple manufactures, you can likely add more cars with different operating numbers to your unit train. Even if you fill out your unit train with purchased-new models, you will find that, as time goes by, the price of each car or new set is actually going down, especially when you adjust for inflation. Why? Because the manufacturer has already recovered the investment in development and tooling with the first few runs, and can now produce these cars for less money than models that require brand new tooling. While the above may make it sound as if it’s really complicated to have a unit train of cars with all different numbers, actually building such a train is less complicated than describing all the considerations that may go into modeling such a train. And, hey, those long unit trains do look impressive. I hope some of the above explanations of catalog and operating numbers may also be helpful in understanding how these apply to other models, not just to those in unit trains.